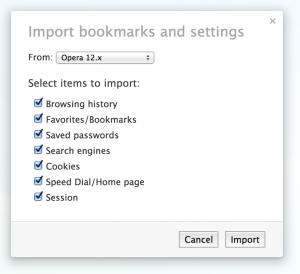 When we released Opera 25, we brought back bookmarks in a new visually-orientated way. With the beta release of Opera 26, we made it easy to share your bookmark collections with friends and family, even if they don’t have Opera. Opera 26 adds a new Share button inside bookmark folders. Click it and you can share the contents of the folder. Have you amassed a collection of sites related to your favourite sport or hobby? Create a share link and pass the collection to your friends. Did you plan the week’s dinners using recipes from various sites? Bookmark them and share the menu with your partner. 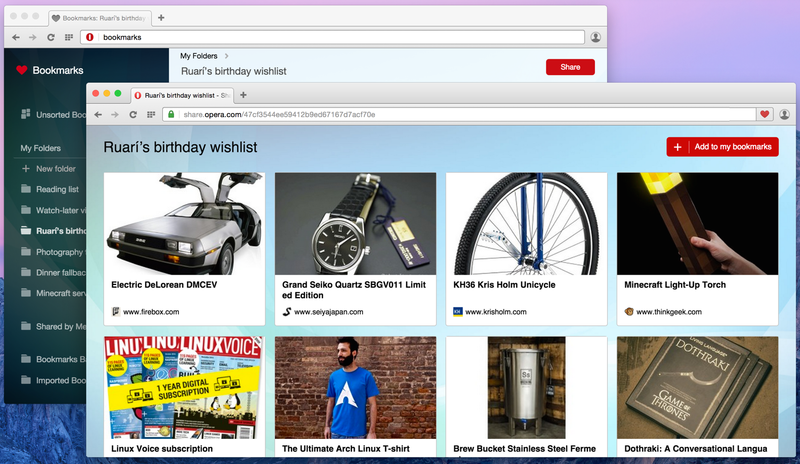 Better yet, bookmark all the things you want for your birthday and share them with everyone! The links you share show a visual representation of your bookmark collections and can be viewed in any browser. If the person you share with is using Opera, the collection can be imported to their Opera browser by clicking the Add to my bookmarks button. Start sharing content with your friends and let us know what you think of this new feature in the comments below. 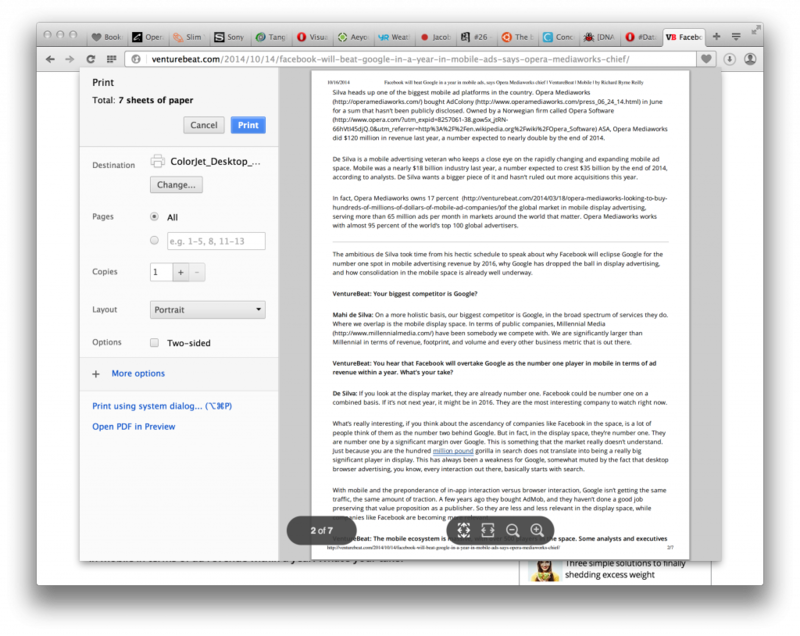 We added a built-in print previewer, so you can see how a page will look before wasting paper. 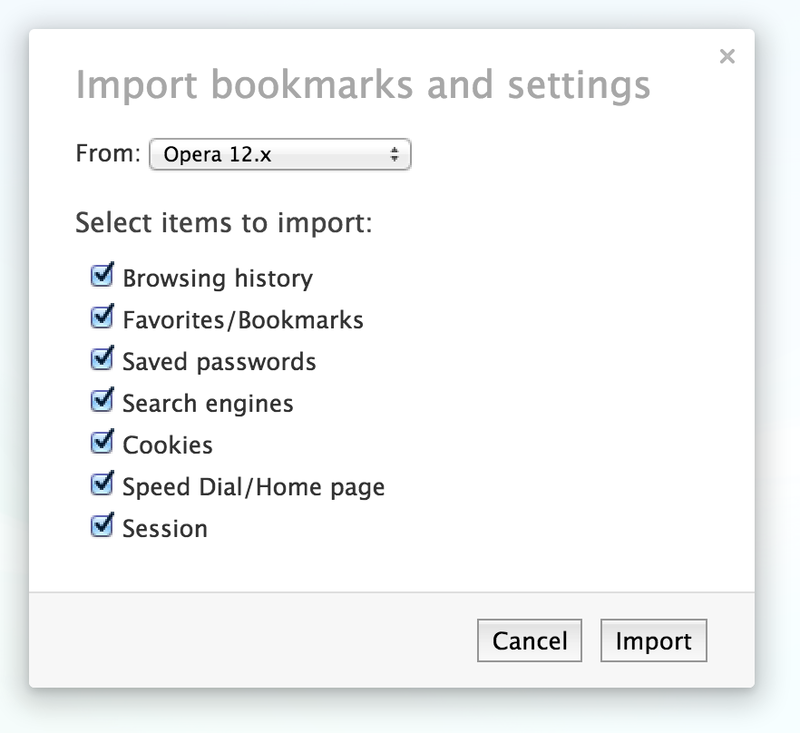 In Opera settings, we now have a range of options to easily transition from another browser and retain all your old data. 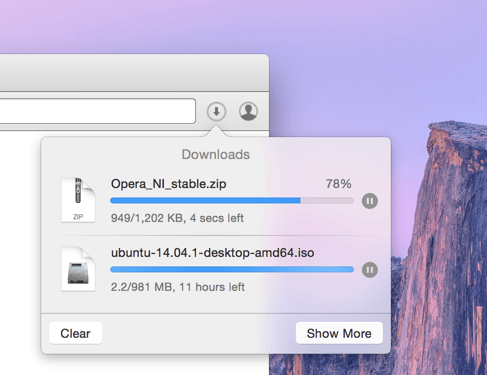 The excitement surrounding Mac OS X Yosemite didn’t escape the Mac team here at Opera. We have started to make our product more visually appealing in the new operating system. First, we updated all our popover dialogs. They have a new “native” animation, make better use of screen real estate and look fantastically vibrant. We also added support for Apple’s Handoff feature. So, if you started browsing a website on your iPhone or iPad and want to continue on your Mac, it is now as simple as walking up to it and handing off the page. We greatly appreciate the feedback we get from this blog. We listened to what you said about our tab preview feature and have disabled it by default. You can enable previews in the browser’s preferences, and we still believe it is a great way for those using many tabs to find their way around. However, if you only work with a few tabs, we understand that you may not need it. The full list of fixes is available in changelog.